Built 1885 by Friedrich Henkenhaf and Friedrich Ebert as a Grand Hotel. 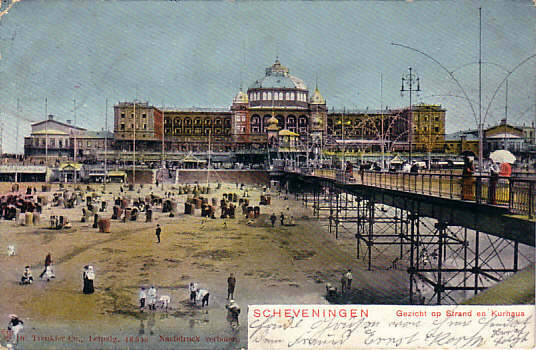 Opened 11 July 1885. Destroyed by a fire on 1 Sep 1886. Subsequently rebuilt. Re-opened 19 June 1887. Main hall "Kurzaal" used for concerts and various other events. Various rebuildings and demolitions. 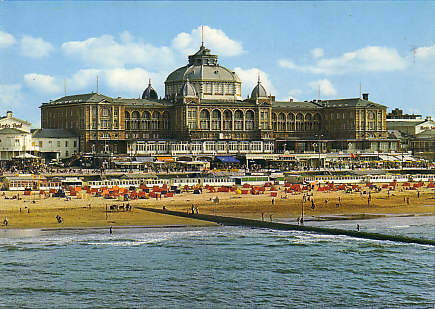 1972-1975 major restoration and rebuilding by Bart van Kasteel. 2001 renovations. 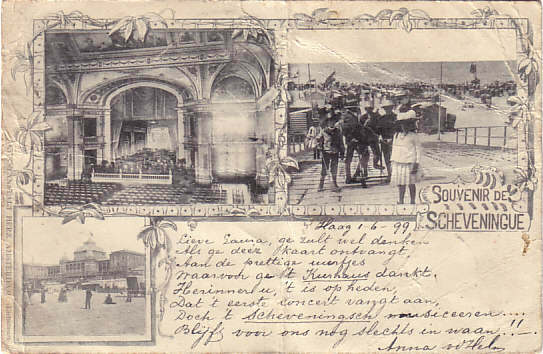 Front Text: "Scheveningen - Gezicht op Strand en Kurhaus"
Front Text: "Souvenir de Scheveningue"
Reverse Text: "Scheveningen/Holland - Kurhaus"